Obv: Bust of Apraxin Legend in Cyrillic translated as: "Fi(odor) Ma(tveyevich) Apraxin; Admiral of his Royal Majesty"
Rev: Ships in battle; Legend in Cyrillic translated as: "He who guards this does not sleep; Better death than disloyalty"
This piece may be a copy of a medal originally executed by Solomon Gouin and Gottfried Haupt. Count Fiodor Matveyevich Apraxin (1661-1728) was a Russian admiral who early in his career served the little Tsar Peter, who became a life long friend. In 1693 Apraxin was appointed governor of Archangel, the most important commercially of the Russian provinces, and built ships capable of weathering storms. He later was to play a leading role in the creation of the Russian Baltic fleet. In 1700 he was appointed Chief of the Admiralty. 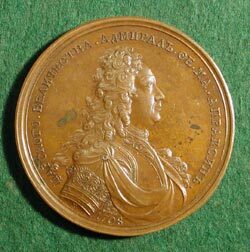 In 1708, Apraxin was appointed commander in chief in Ingria, to defend the new capital of St. Petersburg against the Swedes. 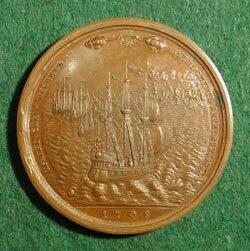 Apraxin battled and routed the Swedish fleet in this encounter, the event commemorated by this medal.